Are there Benefits If You Drink Kombucha Tea? The internet is all a buzz about the benefits of Kombucha Tea, but what is kombucha? According to the Mayo Clinic, Kombucha tea is a fermented drink made with tea, sugar, bacteria and yeast. Although it’s sometimes referred to as kombucha mushroom tea, kombucha is not a mushroom — it’s a colony of bacteria and yeast. Kombucha tea is made by adding the colony to sugar and tea, and allowing the mix to ferment. The resulting liquid contains vinegar, B vitamins and a number of other chemical compounds. Gut health – the pro-biotics released in the fermentation process are similar to healthy bacteria that are found in the gut. Probiotic bacteria have been linked to helping diarrhea and irritable bowel syndrome. Cancer risk – Some studies show that drinking kombucha may help reduce the risk of cancer. It’s important to note that these studies were conducted on cells in a test tube. Infection risk – Acetic acid found in vinegar is also found in kombucha after it ferments. 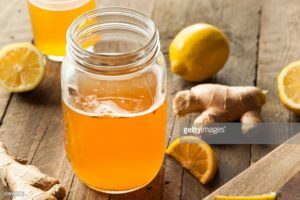 Mental Health – Since probiotics have been linked to treating depression and probiotics are evident in kombucha after fermentation, it may help alleviate some of the symptoms of depression. Heart disease – Some studies have found that kombucha helps reduce levels of cholesterol that may cause heart disease. The Mayo Clinic further reports that there have been adverse effects while using kombucha. Some people complained of an upset stomach, infections and at times an allergic reaction. This may have been caused because contamination can occur if the tea is brewed in homes with a nonsterile preparation area. They further state that since there isn’t enough evidence that kombucha tea delivers on its health claims, the safe approach may be to avoid kombucha tea until more definitive information is available. This entry was posted in Health and tagged fermentation, kombucha, tea, yeast by Joann Ariola. Bookmark the permalink.